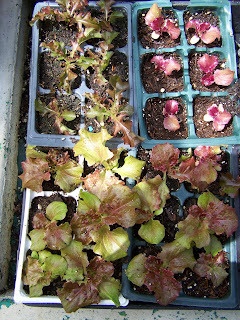 I've started a new blog called "The Learning Garden - Almost - Daily," and this photo of some lettuce seed trials appears in the very first post there. These are so-called 'summer lettuces' that we're trying to ascertain how well they will do in the Southern California summer heat. Following, I list a few of the seed houses I order from consistently. I tend to order most of my seeds from Pine Tree Garden Seeds simply because I rarely need the quantities of seed per packet that I get from the other companies. I pay less, I can experiment with different varieties and I have less seed left over at the end of the season. What's not to like? Their listings include almost all the main varieties I want to grow. FEDCO SEEDS; PO Box 520, Waterville, ME 04903; 207.873.7333; www.fedcoseeds.com A very funky catalog, that makes me think of the Trader Joe's Frequent Flier, provides good quality open-pollinated seeds. While their focus is on 'cold-hardy, short season' seeds, we can use a lot of them here. As of August 31, they will no longer take orders for 2009. They begin to prepare for 2010's growing season. Their prices are really low - puts places like Seeds of Change to utter shame. And they are all open-pollinated. PINETREE GARDEN SEEDS; PO Box 300, Rt. 100; New Gloucester, ME 04260; 207.926.3400 www.superseeds.com This is THE catalog where I order most of my seeds – they are the least expensive. How? The packets are smaller, fewer seeds. And that makes good sense for us with smaller sized gardens. If I want more, I can order more packets – but usually I order several varieties with which to experiment. SEED SAVERS EXCHANGE; Rt. 3 Box 239; Decorah, Iowa 52101; 563.382.5990 Membership fees $25. Free brochure. www.seedsavers.org This is the other main source of seeds for me. I have been a member for over five years because I believe in the work they do saving the rich heritage of heirloom seed varieties that might well be a thin green line between us and the Monsanto's of this world that are striving to control our food supply. I urge you to order from the Exchange and to become a member; we NEED these seeds.